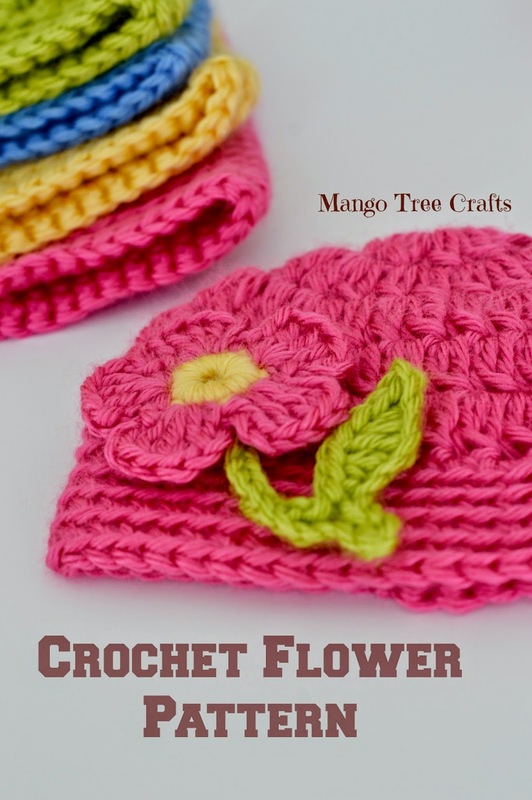 With spring and Easter just around the corner I would like to share this free flower crochet pattern with you. It would look great sewn on a crochet beanie for little child. You can find my free crochet beanie pattern for any size here. Wouldn’t it make a nice gift for an Easter basket for a little girl in your life? Acrylic yarn in colours: Watermelon (for hot pink), Sunshine (for yellow) and Chartreuce (for green). Any worsted weight yarn would work. Wrap yellow yarn around your pinky finger ten times creating a thick magic loop. Work 10 SC into magic loop, Sl ST, cut off and weave in ends. 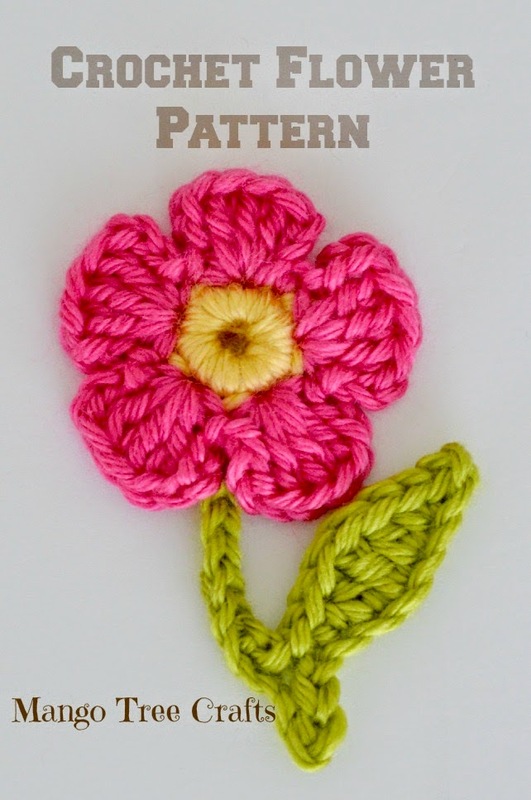 With pink yarn (start in any stitch) *SC, CH3, 3 DC, CH3, SC in the same stitch, skip 1 ST*, repeat around four more times to make a total of five petals. Cut off and weave in ends. Attach green yarn to any stitch at the back of the flower and work: CH12, 1 Sl ST in the 2nd CH from hook, 1 Sl ST in next ST. Do not cut off, continue with the leaf. CH 8, Sl ST in the 2nd chain from hook, SC in next ST, HDC in next ST, DC in next ST, HDC in next ST, SC in next ST, Sl ST to the chain that forms the stem of the flower. Cut off and weave in ends. 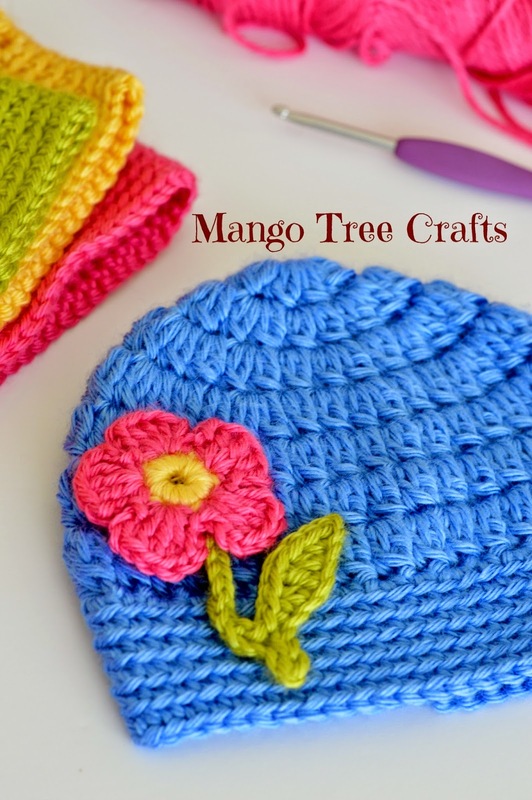 Sew applique to a crochet hat or other garment of your choice. Dear Lily, my sweet niece gave me your web site and I aBsolutely love and appreciate your patterns thank you . Lily, Thank you for this little joyful flower ! I want to make a basket full for my big yard sale this spring. It’s for a “25 cents kidz only” basket so they can buy something nice for Mommy or a sick friend. I’ll put a nice big safety pin on the back and put them in a little ziplock bag for them. the little ones love to find something they can buy.